Sexual health is considered an important part of people’s physical and mental well-being, closely related to sexual rights  which is an important area for social work. Social work also includes advocating effectively for social justice and responding to global realities, which is connected to sexual and reproductive health and rights . Social workers find sexual health issues relevant to their clinical work, and yet there has been a lack of education in this field in social work education [3, 4]. In addition, there seems to have been low commitment to integrating these issues into existing curricula in social education programs [5, 6]. This is of interest since social workers are uniquely poised to inform about sexual health while taking into account the biopsychosocial needs of a person and supporting autonomy, right to intimacy, and client well-being . Sexual health should also be included in the education of social work students, since clients expect social workers to be competent in this field . This expectation may also be common among other health care professionals, creating risks of unmet needs and misunderstandings. To understand how to best educate social work students regarding sexual health, it is essential to explore the current state of social work students’ attitudes and perceived competence and educational needs regarding communicating about sexual health in their future profession. Exploring the current situation is also important since beliefs about sexuality and sexual health can be individually fashioned, dependent on previous education and contextual factors [3, 5, 8]. To enable social workers to handle sexual health issues successfully, it is therefore vital that knowledge about sexual and reproductive health is included in undergraduate education at universities and colleges . A report presenting an investigation of how sexual and reproductive health and rights are present in the curricula of Swedish social work education shows that goals and content relating to sexuality and sexual health are unusual . These issues do not seem to be addressed to any significant extent in higher education in Sweden, despite the fact that sexual and reproductive health is one of the 11 public health target areas in Sweden . Previous research has shown that health care professional students lack education, and feel unprepared to address sexual health in their future profession and uncomfortable doing so. Those studies have included students from nursing, occupational therapy, physiotherapy, prosthetics and medicine [12, 13, 14], but there is scarce research concerning social work students’ views in this field. From a Swedish perspective, social workers encounter sexual issues related to drug or alcohol abuse, family and relation problems, sexual violence, and prostitution, and there is a need for social workers to be competent in addressing sexual health . Furthermore, these sexual health issues are also important in meetings with individuals with disability and the elderly, where the topic is often ignored [6, 16, 17]. 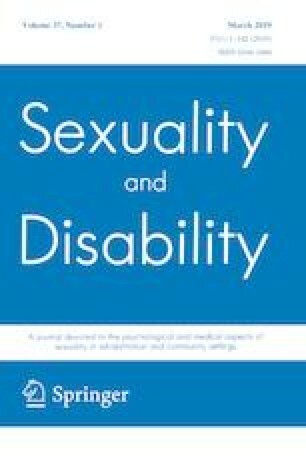 When social workers avoid issues of sexuality and sexual health, the discomfort experienced when communicating about sexuality and sexual health can create barriers toward clients in the social workers’ performance of practical social work [8, 18]. Among health care professionals there are both educational barriers to addressing sexual health, including lack of knowledge and competence, and emotional barriers such as embarrassment, awkwardness and fear [19, 20]. Barriers experienced by other health care professionals are similar to the barriers described by social workers [8, 9]. The aim of the present study was to explore Swedish social work students’ attitudes and perceived competence and educational needs regarding communicating about sexual health in their future profession. This was a quantitative study using the Students’ Attitudes toward Sexual Health (SA-SH) . The SA-SH has shown good psychometric qualities when used in previous studies [14, 21, 22] and is reliable and valid to use also for social work students . The SA-SH questionnaire addresses student attitudes toward addressing sexual health issues in their future profession. The SA-SH comprises 22 items distributed across four domains: present feelings of comfortableness, future working environment, fear of negative influence on future patient relations, and educational needs . In addition there are descriptive questions related to gender, age, and educational level within the program included in the questionnaire. Items within the questionnaire are answered on a Likert scale with five options: disagree, partly disagree, partly agree, agree, and strongly agree. Items 9–14, and 16–18 were reversed for analysis as these items were phrased in a negative way compared to all the other items. The participants were students enrolled in a social work program in Sweden. The sample size was limited to the students enrolled in the program, and in total 242 students participated (Table 1). Some enrolled students were not present at the data collection; therefore, the response rate is calculated based upon those students who were present. During the data collection there were no students in semester 5 due to organizational changes of the social work program. The average age was 26 years, ranging between 19 and 53 years of age (standard deviation 7.07, 240 of the participants stated their age). The paper-based questionnaire with written information about the study was handed out in the classroom to optimize the response rate. All students present in the classroom during the lecture when the data collection was performed were invited to participate. Prior to receiving the questionnaire, the students were given oral information concerning the study and were assured that participation was voluntary. When the questionnaire was handed out, the students had the option to decline to participate, or to remain in the classroom and either answer the questionnaire or hand in an unanswered questionnaire. The items in the questionnaire can be divided into four different domains, which are presented in boxplots. The analysis of semesters was based on a previous Latent Class Analysis of the SA-SH, consisting of three response patterns based on the total score of the SA-SH . To create a total score, the responses (1–5) were summed up in all 22 variables. The possible total score values of the SA-SH are between 22 and 110. The response patterns are divided as follows; 1. Uncomfortable and unprepared (range 30–56), 2. Comfortable and prepared in some situations (range 57–79) and, 3. Comfortable and well prepared (range 80–104). 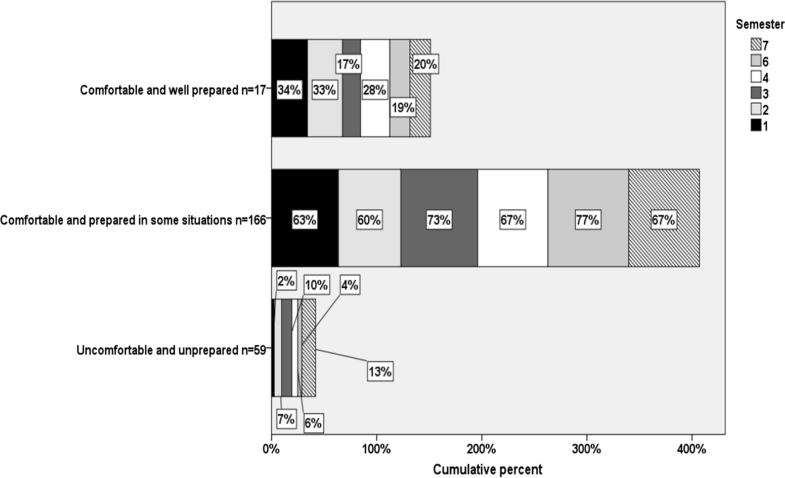 The response patterns can be translated into total score groups, which enables quick and valid calculations of students’ perceived level of comfort and competence to work with sexual health issues in their future profession. No imputations were performed for missing values. Descriptive statistics are presented in median minimum and maximum values, frequencies and percent. The total population was divided into two age groups based on the average age, 26 years. Subgroup analyses for age groups and semester were carried out with χ2 and Fischer’s exact test. Linear regression was used to analyze trends between response patterns and semester. The significance level was set to α = 0.05. All statistical analyses were performed using SPSS version 25. The response rate was (91%), 242 of 265 potential participants responded, with a higher proportion of non-responders in semester 4. The results are presented for each domain for the total sample (Figs. 1, 2, 3, and 4), and for subgroups based on gender, age and semester. Figure 1 describes the answers to items 1–9 in the material. These items together form the domain called ‘Present feelings of comfortableness’. Communicating about sexual health is presented as more difficult when the items were specified for meetings with people of different ages, sexes and cultural backgrounds (Fig. 1). On the other hand, the client’s sexual orientation did not seem to make the conversation more difficult. It is noteworthy that when anticipated future conversations were expected to be about specific sexual activities, the students considered the topic to become more inconvenient. Figure 2 describes the answers to items 10–15 in the material. These items together form the domain named ‘Future working environment’. The students thought that they would take time to talk about sexual health in their future professional life (Fig. 2). The students also voiced concerns that the clients may feel embarrassed and uncomfortable if they, as social workers, addressed sexual health, even though they did not think that that they themselves would be embarrassed to the same extent. Figure 3 describes the answers to items 16–18 in the material. These items together form the domain named ‘Fear of negative influence on future patient relations’. The students considered their future colleagues potentially ready to address sexual health issues (Fig. 3). Figure 4 describes the answers to items 19–22 in the material. These items together form the domain called ‘Educational needs’. A large majority of the students answered that they had not received education on sexual health and had insufficient skills to communicate about sexual health in their future profession (Fig. 4). The vast majority also stated that they needed basic knowledge of sexual health as well as learning to communicate about sexual health. There were no significant differences concerning gender for any of the 22 items. The two age groups showed significant differences for six items (items 2, 5, 9, 12, 16, 21), where students older than 26 years had significantly higher scores (Table 2). The most common response pattern was “Comfortable and prepared in some situations” (mean cumulative percent ≈ 68%) among all semesters. For each separate semester, the response patterns followed the response pattern for the complete sample; “Comfortable and prepared in some situations” had the largest share (60–77%) followed by “Comfortable and well prepared” as the second largest share (17–34%). There were no significant (p = 0.11) trends between changes in response patterns and semesters (Fig. 5). Due to the lack of significant differences in response patterns when comparing all the various semesters, additional analyses of potential significant differences between semesters 1 and 7 were performed, to further explore potential changes during the education. There were significant differences (items 1–8 and 10) between semesters 1 and 7, where semester 7 had a lower percentage share over 3 than semester 1 (Table 3). Judging from the responses and the high response rate, the social work students considered knowledge about sexual health as important for their future profession. The results obviously showed that the students felt they lacked sufficient knowledge and competence in the field, which may have affected how well they succeeded in addressing the needs of their future clients. Lack of comfort in addressing sexuality and sexual health issues with clients has been described as being due to lack of education in this field . It is of interest to notice the lack of progression during the education regarding response patterns, considering that most students did not consider themselves comfortable and well prepared to handle issues related to sexual health in their future profession. This is of particular interest to explore further, since the students in the last semester rated themselves as less comfortable concerning communicating with clients regarding sexual health compared to students in their first semester. A possible explanation may be that the students achieved increased theoretical knowledge of conversation skills and ethics during their education, which increased their understanding of complexity, which in turn may have led to the students feeling less comfortable and less prepared to address sensitive topics. In addition, it can be assumed that the students’ practical experience in placements during their education increased their understanding of the complexity of different social work situations, even if sexual health was not specifically addressed. Failing to address sexual health issues in social work practice may lead to poorer health for clients, especially for vulnerable groups, such as the elderly, the disabled, and minorities. Additional research concerning students’ experiences of their development of communicative skills during their education, especially concerning sensitive topics, such as sexual health, is a field for further research. The fact that students found it more difficult to talk about specific sexual activities is not surprising. The more specific questions become, the more you may suspect the questions will be experienced as sensitive, creating hindering emotions that can be perceived as barriers to communicating about sexual health. Judging from our results, educational efforts need to be strengthened concerning issues of sexual health in social work programs. As sexual health is an important aspect of human health where social workers can make a positive difference [5, 6, 7], there is a strong motivation to increase the incorporation of elements of sexuality and sexual health in social work education. To ensure effective educational interventions it is necessary to consider the context of the social work education and future working area. Therefore, prior to planning and performing educational interventions it is of value to conduct evaluations of attitudes, knowledge, and ability to communicate about sexual health for the targeted group. This will optimize the results of the intervention and thereby increase the potential for developing a sustainable and trusting relationship between the client and the future social worker. There are four key qualities for enhancing social work practice related to sexual health that are recommended to be included in educational interventions; (1) non-judgmental attitude; (2) knowledge about sexual well-being and the intersection of disability and sexual expression, health and well-being (3) openness and willingness to discuss sensitive issues, including sexual well-being; (4) trust . Barriers to addressing sexual health, such as lack of knowledge and competence, and emotional barriers such as embarrassment, awkwardness and fear [4, 8, 9, 19, 20] need to be actively addressed and decreased through educational interventions. There is also a need to include positive discourse on sexuality and sexual health, since education in social work in this field is often negatively focused on sexual risks, sexually transmitted diseases, sexual abuse and violence . A more positive approach to sexuality and sexual health is essential to decrease cultural barriers in this field . Further studies of the outcome of educational interventions regarding sexual health in social work programs are needed. The lack of gender differences in this study is worth exploring further, since there have been gender differences in research on other health care student groups. In a study of students in nursing, occupational therapy and physiotherapy, female students acknowledged the need for education regarding sexual health and training in communication regarding sexual health issues to be significantly more important than did male students . Female students in prosthetics and orthotics were more likely than male students to take time to address sexual concerns , which was not seen for social work students in this study. The SA-SH does not include questions regarding the students’ attitudes toward addressing sexual health for persons with physical or psychological dysfunctions. This limitation of the questionnaire presents an important field for further research, since previous research has shown the beneficial role of social workers in supporting adolescents with functional abilities to make empowered decisions regarding sexual health issues . The high response rate strengthens the credibility of the results, but additional studies from other social work programs are needed to ensure the transferability of the results. However, the results are in line with the previous report of a low level of inclusion of sexual and reproductive health and rights in social work education in Sweden, suggesting the relevance of the results also for other social work programs in Sweden . During the data collection there were teachers from the social work program present in the classroom, which was commented upon by some of the participants but accepted by them. This procedure may have influenced the response rate; however, it is unlikely that the answers were influenced since the teachers were not involved in the research project. The conclusion of this study is that social work students are not adequately prepared or competent to address issues concerning sexual health in their future profession. Social work programs need to increase sexual health education and training in communicating about sexual health issues, to enable the needs of the clients to be met. Further studies are recommended in this field. This study was funded by Futurum-Academy for Health and Care (FUTURUM-864271).